I took a long ride today to do some exploring and run some errands. I grabbed my commuter bike, just because it was handy in the garage, and I didn’t have to check anything over other than pumping up the tires. Throughout the ride, my fenders seemed to be rattling and making a lot more noise than they should; they have been pretty securely installed up until now. I stopped to check them out; after bouncing the bike up and down a bit and wiggling the fenders with my hand, I figured out that the noise was coming from the rear fender. 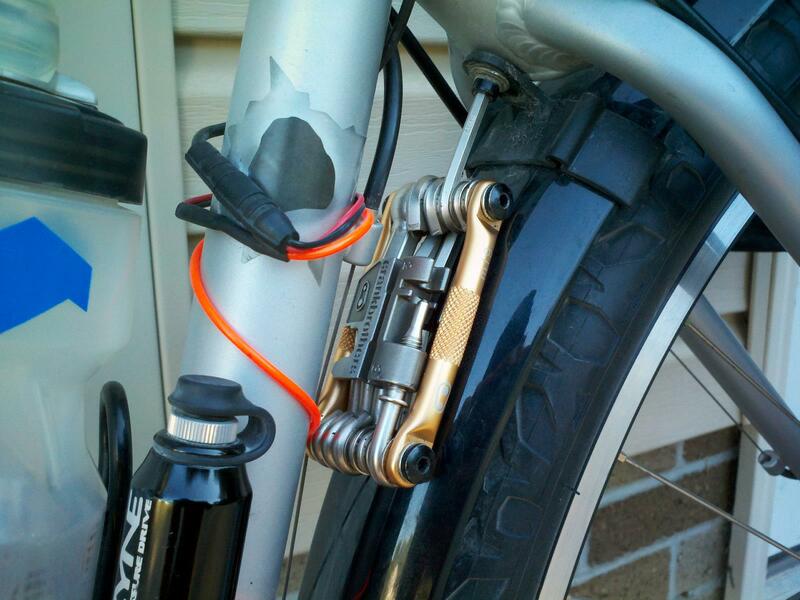 The bolt holding the rear fender to the seatstay bridge had worked loose a bit. This is normal; especially since this is my commuter bike, I should check these kinds of things more often. I took out my multi-tool to tighten the bolt up. I found that the space was so tight between the seat tube and the fender that no matter which way I oriented the tool, there was no room to turn it to tighten the bolt, not even a tiny little bit at a time. This is the Crank Brothers Multi-19 tool; I’ve found it to be quite a fine tool for most situations, and I would have had this problem with just about any folding multi-tool. For these situations, you really need an L-shaped hex wrench. That’s why on overnight tours, I carry a small set of L-wrenches to be prepared for any roadside repair situation. The set that I bought were sold under the “Lifu” brand at the time. Since then, I’ve found that you can get them sold under the “IceToolz” brand. The set comes with metric sizes 2-2.5-3-4-5-6, plus an 8mm adapter. There are ball ends on the 4, 5, and 6mm wrenches. 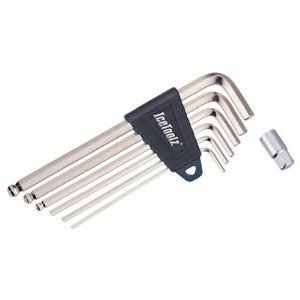 The wrenches aren’t as long as you’d get with a shop-quality set, but they’re far more useful in tight situations than any multi-tool. The separate 8mm adapter is the only thing I don’t care for; these things inevitably get lost. I may pick up an extra set or two of these wrenches so I can keep them at hand on more of my bikes.